What are Dog Allergies Caused By? The major dog allergen, called Can f 1, is primarily found in dog saliva. Unlike cat allergen, which is found in the dander from sebaceous glands in the skin, the skin of dogs does not appear to be a major source of Can f 1. Dog albumin, a protein found in the blood, is also an important allergen, and may cross-react with albumin from other mammals, including cats. How Common is Dog Allergy? 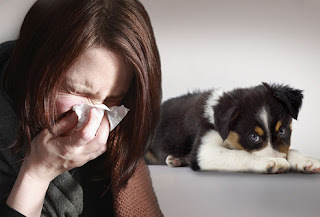 Allergy to dogs is relatively common, as dog allergen can be found in public places, including daycare facilities. However, cat allergy is far more common, which may be related to the higher potency of cat dander as an allergen, as well as the fact that cats are not generally bathed at the same frequency as dogs. Regular bathing of pets, particularly dogs, would be expected to reduce much of the allergens released from the animal. Recent studies show that dog ownership can protect against the development of allergies in young children. This is due to endotoxin, a protein released from dogs (and other animals, particularly farm animals) that stimulates the immune system away from allergies. Infants living in homes with indoor dogs are far less likely to wheeze compared to infants living in homes without dogs. However, it is important to note that endotoxin may also worsen allergies and asthma if present in the home after a person living in the home has already developed allergies or asthma. 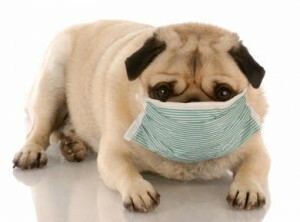 How Can Symptoms be Controlled for Dog Owners with Dog Allergy? If the above measures do not help to reduce allergic symptoms, getting rid of the pet dogs may be needed, particularly for people with uncontrolled asthma. Do Some Breeds of Dogs Cause Less Allergies Than Other Breeds? Possibly. It appears that some people can be allergic to certain breeds of dogs and not to other breeds. While there is no such thing as a non-allergenic dog, some breeds can cause less allergies than other breeds. Here is a list of low-allergen dog breeds that may be better tolerated by people with dog allergy.